This past weekend, Max Holloway and Brian Ortega left it all inside the octagon in Toronto at UFC 231 for the featherweight championship. It was an incredible fight that Holloway won after doctors called for a stoppage before the start of the 5th round. Unlike any Conor McGregor fight, there wasn't a lot of trash talking leading up to or during the fight. 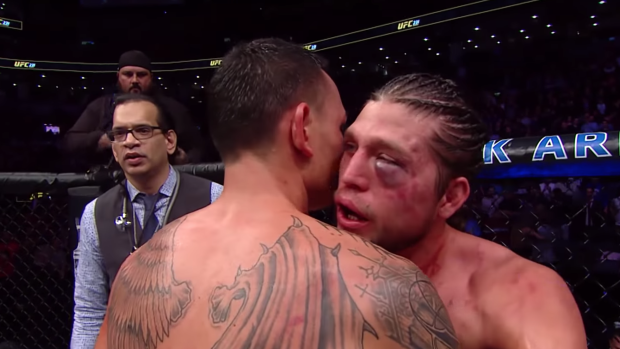 Both competitors displayed an incredible amount of respect for one another before, during, and after the fight, and there was one moment caught on camera that will warm your heart. That's why we love sports today. Sure, the rivalries are great and the trash talking is, too, but at the end of the day, we love to see competitors put everything aside and share moments like this with one another. Ortega put up a valiant effort, but Holloway won in the end and we're sure both fighters earned one another's respect. If they ever fight again, we'll be first in line to watch them go at it wherever they decide to square off.